Open Letter to Retailers: Stop Wasting my Time! 1) Figure out how each customer wants to be treated – Said another way, treat your customers the way they want to be treated. This sounds obvious, but apparently it is not. Some customers have questions, some want to be left alone. Some want you to follow-up with them and some do not. Some want to be emailed and some do not. Remember the goal for your business is repeat customers, not clicks, not short-term sales, not page views. The easiest way to know this is to ask each customer and then listen carefully. 2) Be available to your customers – Your customers are online doing research before they enter your store (in case you weren’t aware of the internet). Your customers are better informed than ever when they walk through that door. Make your team available to them throughout that journey in case they want to speak with someone while they are online or in-store. Come out from behind the cash register and interact with your customers. Put your team in some T-shirts with a mobile payment solution so they are available and approachable. 3) Help your customers – Your job and your employees jobs are to help your customers purchase the right product. And not every product is for every person. So giving your team incentives only to sell the most is not going to maximize long term revenue. Again, giving your team incentives to sell the most is not going to maximize long term revenue. Talk to your customer, understand their needs, answer their questions. The highest revenue per square foot store in the world is the Apple store and I would argue is one of the few places where employees are really excited to help customers with their questions–hire people like that. 4) Build a relationship with your customers – Your customers don’t want to be your friend, but once they find a sales person they like, they do want to maintain a consistent relationship. Get a communication tool like Purple Cloud or a CRM tool, or anything that your employees will actually use to help them recall their customers and not simply to spam them. 5) Be genuine – Figure out a great product to sell, hire people who love to help customers buy the types of products you sell and then repeat. Marketing, visual merchandising, inventory management, POS systems and all the other things people worry about are so less important to the quality of the product and the quality of the people who love to help you buy that product. The best thing about this formula is that quality people will insist on the product as well as the other aspects of the business being great. 6) Be omni-channel – 50% of eCommerce sales is going to companies that have brick-and-mortar businesses. Amazon, Warby Parker, Bonobos all opened brick-and-mortar stores. 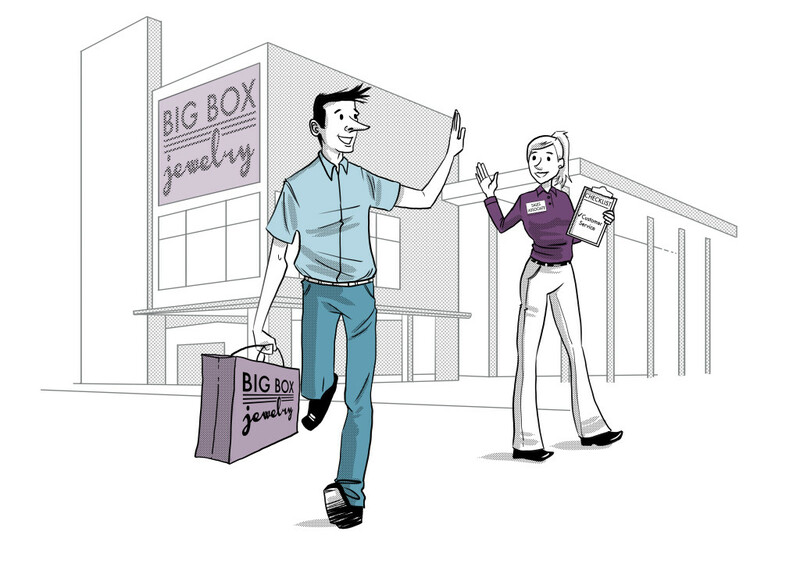 The future of brick-and-mortar is omni-channel. If you don’t know what omni-channel is, just continue to read my blogs. So simple, yet so smart! Very intelligently written! !